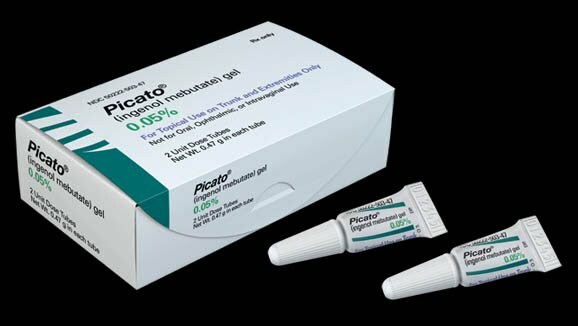 Picato is a cream used to treat sunspots. Picato comes in 2 strengths. Picato for the face and scalp (0.015%) is supplied in 3 separate tubes. Picato for the body, arms and legs (0.05%) is stronger, and is supplied in 2 separate tubes (see Fig.1). Picato is used for 3 consecutive days on the face and scalp. Picato is used for 2 consecutive days on the body, arms and legs. DO NOT apply picato right after taking a shower or less than 2 hours before bedtime. After application, Picato dries after 15 minutes but do not wash the area for 6 hours. Wash your hands with soap and water after applying Picato. A reaction to picato usually begins on the second or third day and reaches a peak within a week. Where picato is applied, redness, scaliness and crusting is common. The area can become itchy or even painful. Sometimes the area can become infected. Picato can cause severe eye irritation. To avoid getting Picato into or around the eyes, it is important that you wash your hands with soap and water after applying the gel. If you accidentally get Picato gel in your eyes, flush them with large amounts of water and get medical care as soon as possible.